Editor’s note: Astrobites is a graduate-student-run organization that digests astrophysical literature for undergraduate students. As part of the partnership between the AAS and astrobites, we repost astrobites content here at AAS Nova once a week. We hope you enjoy this post from astrobites; the original can be viewed at astrobites.org! Authors: Meredith C. Powell, C. Megan Urry, Carolin N. Cardamone, et al. In astronomy, the relationship between the color and the brightness of objects has been used as a basic classification tool for decades. For stars, color is a measure of temperature; the bluer a star, the hotter it is. Measuring the relationship between observed colors and brightnesses of stars helps astronomers figure out the evolutionary sequences of stars. It turns out that you can do almost the exact same thing for galaxies. Except this time, the color of a galaxy is a measure of how quickly it produces stars, called its star formation rate. This is because hot (and therefore blue) stars are extremely bright, despite being relatively rare, so they can make a whole galaxy appear blue. And such hot stars don’t live for long, so if a galaxy has these stars it must have formed them very recently. On the other hand, the brightness of a galaxy is roughly correlated with its mass, since a more massive galaxy will generally have more stars and therefore be brighter than a less-massive galaxy. In the same way we use color-magnitude diagrams to determine how stars evolve, we can use a plot of galaxy color (star formation rate) against mass (brightness) to figure out how galaxies evolve. 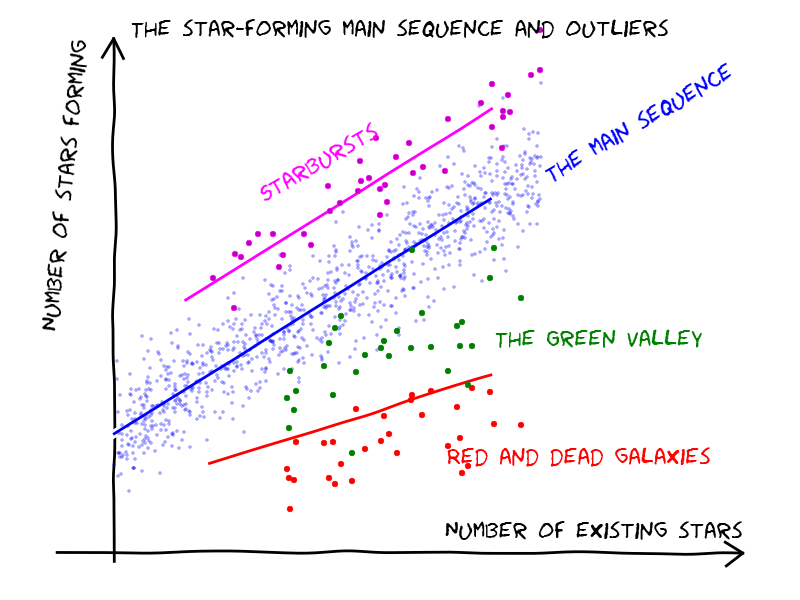 Figure 1 (which is a cartoon that I’ve shamelessly borrowed from this previous Astrobite) shows a few basic trends that emerge from this color-mass plot. There’s a “main sequence” of blue star-forming galaxies, where most galaxies lie. It’s thought that galaxies move from this main sequence to the “red and dead cloud,” made up of red galaxies that aren’t actively forming many stars. Not many galaxies are located in the region between these two areas, sometimes called the “green valley,” suggesting that galaxies don’t stay there for a very long time — so the processes that “quench” (turn off) star formation in blue galaxies must be relatively fast. These basic trends appear on the color-mass diagram in the nearby universe at z~0 (z is what astronomers call “redshift,” which is both a measure of distance and of the universe’s age). Today’s paper aims to understand the trends on the color-mass diagram at higher redshifts (z~1), when the universe was younger — less than half its current age! 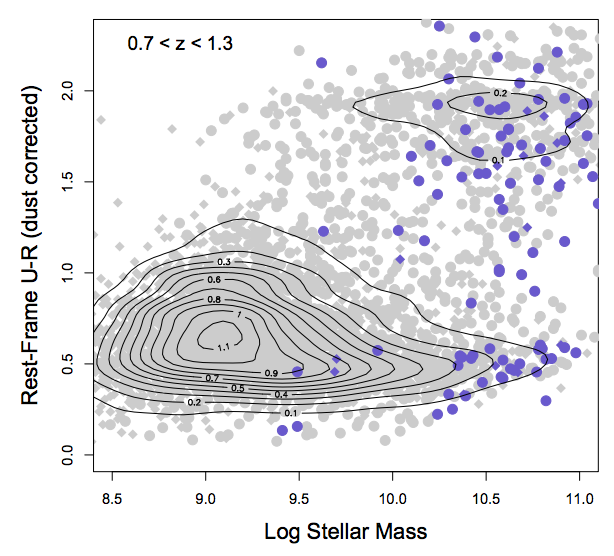 Do overall trends in the color-mass diagram look different at high-redshift (z~1) than at low-redshift (z~0)? Do elliptical (what the authors call “bulge-shaped”) and spiral (“disk-shaped”) galaxies follow the same trends on the color-mass diagram? If the answer to question (1) is “yes,” then we know that the processes that shut off star formation have changed from redshift z~1 to now. And because most bulge-shaped galaxies are thought to be the results of galaxy mergers (although this is up for some debate), answering question (2) would help us figure out how mergers affect galaxy evolution. To address these questions, the authors first used Hubble Space Telescope images (specifically, the GOODS and CANDELS surveys) to measure the colors of about 5,000 galaxies. Next, they matched the galaxy spectral energy distributions to theoretical models in order to infer their masses. Finally, they fit the galaxy images to different profile shapes to distinguish between “bulge” and “disk” galaxies. Armed with this data, let’s see if the questions above were answered. Do overall color-mass trends change with redshift? Figure 2 shows the color-mass diagram at z~1. Like Figure 1 (which is a cartoon of the z~0 color-mass diagram), it shows that the “main sequence” and “red and dead cloud” are mostly distinct. The main difference is that there are fewer “red and dead” galaxies than at z~0. This is probably because there hasn’t been as much time since the peak of star formation in the universe (which was at redshifts z~1–3) for galaxies to move away from the main sequence. Do bulges and disks follow the same color-mass trends? So we’ve answered all our questions! But the authors note that there are still some unclear results. For instance, they also compare the color-mass trends of active galactic nuclei (AGNs; the purple points in Figure 2) with the trends of inactive galaxies. This is an important question in galaxy evolution, since it’s not clear whether feedback from AGNs helps to trigger or quench star formation. The authors find that AGNs might have some effect on quenching, particularly in mergers, but more data is needed to be certain. 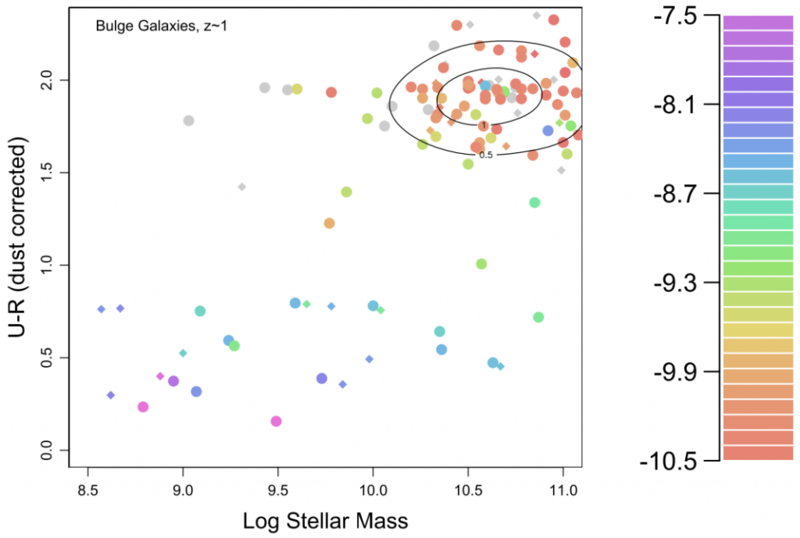 The color-mass diagram has been around for a while — but as today’s paper shows, it’s still an incredibly useful diagnostic tool that can teach us a thing or two about galaxy evolution. I’m a postgrad student at the University of Cambridge, where I work with Rob Kennicutt to study star formation in galaxies (mostly I make lots of graphs). I did my undergrad at NC State University, which is where I started making graphs. Now, whenever I’m not making graphs, I can usually be found rock climbing or eating baked goods.